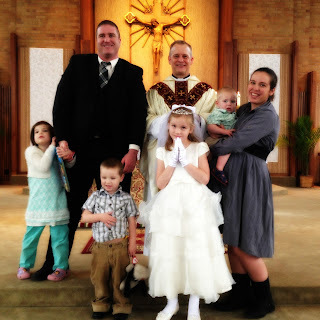 In the post about Sadie's first communion I mentioned briefly the trip to labor and delivery that I took on Saturday afternoon and how it really deserved it's very own post. But it all really began on Friday night when just before bed I noticed some light spotting. This is different, was my first thought, only because usually I don't have spotting in the third trimester. There was no reason for the spotting, other than maybe carrying James around more than usual. I didn't call my doctor though. After having subchorionic hematomas during two pregnancies (and likely during Patch's too, since I had spotting at 6, 10, 16, and 24 weeks with him) spotting doesn't send me into a panic like it used to. Sadie's First Communion was beautiful, but I spent a good portion of it wrestling with Maggie ("No, we don't touch the shoes of the person in the pew in front of us! Even if we're being very quiet while we're doing it! "), who despite her best behavior was still a handful and I also spent it not drinking the 60 ounces of water that I normally would drink before noon when I'm at home. We stopped by the house to get new clothes for a certain eighteen month old, since he was covered from head to toe in frosting and cake, and I ran into the house to use the bathroom. When I stood up there was a rush of fluid. I froze. I waited. It had stopped. It had only lasted for a moment. I held very still. I felt completley normal. As I collected James' clothes I was nervous. When my water broke with Sadie it was only a trickle, far less than what I'd just experienced. When it broke with Patch it was more like it was in the movies, where it goes on and on and you wonder how much amniotic fluid can be around one little baby. This was somewhere in between. I changed and made sure I had everything we needed to go out to lunch like Sadie had requested. Then we left. In the car I whispered to Paul that I thought maybe my water had broken, but I wasn't sure, so I guess we'd wait and see if anything happened. At lunch everything was fine. I didn't have a single contraction. So it didn't worry me that while our current home is less than a mile from the hospital, the new house is about half an hour away. After all, everything seemed fine. We were almost to the new house when the first real contraction hit. That this was a real laboring sort of contraction, I had no doubt in my mind. I'd never even felt contractions like this when I was in labor with Patch. This was a contraction of the variety I had shortly before Sadie was born. I looked at the time and recorded it on my phone. But it was only one. And by the time the second one hit, four minutes later, we'd already driven by the house. The third one was three minutes later. When the fourth and fifth and sixth came, two minutes apart, I told Paul to turn the car and head straight for the hospital. I called my OBs line and about fifteen minutes later go a call back from the doctor on call at the hospital. "I know what you're going to say but... I thought I'd call anyways. I'm 30 weeks and 5 days pregnant. I had some light spotting last night. Around lunch time I had a rush of fluid, but I wasn't sure what it was... and now two hours later I'm having contractions that are two minutes apart... They've been that close for almost half an hour now. Okay, that's what I thought. We'll be there as soon as can." And of course she said to come in immediately. The next half hour was excruciating. The contractions were like clockwork, every two minutes, and they were increasingly horrible. By the time we arrived at the hospital and I said goodbye to everyone I was certain I wouldn't be coming home any time soon. They whisked me into triage and checked the baby. She sounded good, but she was transverse, so they had a hard time getting the sensors to stay in place and pick up anything. I lay on my side and waited. Laying down was much, much better. The contractions stopped, altogether, almost immediately. See, I thought to myself, if I just went home everything would have been fine. Except I knew going home when the contractions were that strong and that close together hadn't been an option. Not at 30 weeks. Both the resident and nurse were convinced that my water had broken, and immediately ordered three tests to confirm it, all of which came back negative. I was a little bit dilated, more than I had been in the past, but not enough to worry about. This didn't totally reassure me. When my water broke with Sadie all the tests came back negative too, for hours after it had happened. It wasn't until I was being wheeled in for my c-section after five hours of pushing that there was a rush of amniotic fluid that was actually detectable. The resident was worried that I had a tear at the top of the amniotic sac and that a little fluid had leaked out. She did an ultrasound and the fluid levels still looked in the range of normal. Baby's head was squarely against my right side and her feet were squarely against my left (she's our third baby that spends almost all her time transverse). She explained that all the tests were negative but she just had a gut feeling after everything that had happened that there was a tear... which was a big deal because treatment would be entirely different depending on whether or not my water was partially broken. She explained that the sac might reseal, but that I'd have to watch very, very carefully for any fluid leaking at all. When the contractions had stopped for an hour I was sent home, with orders to drink as much water as I could and to stay in bed. I tried to sit propped on some pillows while Sadie opened her presents, but quickly realized that being flat on my back was pretty much the only option left to me. For the rest of Saturday and almost all of Sunday I stayed in bed. I managed to sit up for around an hour, propped on pillows, twice on Sunday while cuddling with the boys, but anything else caused the contractions to come roaring back, and after sitting up I was exhausted. Still by Sunday evening I could actually sit up and eat dinner. On Monday I tentatively got out of bed. We had accidentally double booked appointments and I there was one that I really couldn't miss for James and Patch if it was at all possible. I sat up and was... fine... I rested as much as possible and while the contractions briefly came back after Maggie's speech session, they went away when I laid down again and I was okay to take Sadie to ballet while Paul fed the little kids dinner. This morning we're back to the little constant Braxton Hicks contractions that mark the second and third trimester in any pregnancy for me. I'm less nervous than I was yesterday and far less nervous than I was on Sunday, and am making every effort to take it easy (Paul has been a huge, huge help both playing with the kids all day and being up with James for much of the night). I do wonder if there was a tear that resealed itself, and I'm praying that this little one stays put for two more hopefully drama free months. Now to go drink as much water as I possibly can to hopefully prevent any more contractions from having an excuse to start! I'm so glad you are doing better. How scary for you! I do not have children so I don't know exactly what you are going through, but my prayers are with you for a drama-free and safe rest of the pregnancy and delivery. You have a gem of a husband. He seems to know you both are "in this" together. That is wonderful! 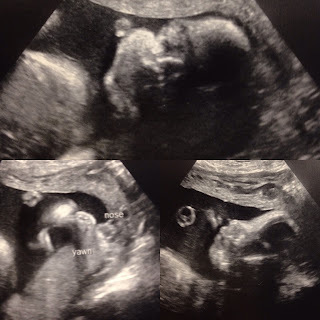 I'm older and we didn't have that much in my day or ultrasounds that show so much. Ultrasound pictures still remind me of Jonah in the belly of the great fish! :) But your precious baby doesn't look stressed out at all and is sweetly sleeping. You all will be in my prayers! Thank you for posting. I just love your title: "A Woman's Place Depends on Her Vocation"